Pakora Recipe – Indian vegetable pakora recipe. Learn how to make pakora with this easy pakora recipe. Wash and pat dry the vegetables. Cut the florets of cauliflower, finely chop spinach and thinly slice the onions. Boil and mash the potatoes in another bowl and add seasoning to taste. In another bowl take chickpea flour (besan), rice flour and add spices. Slowly add some water until the mixture reaches the consistency of whipping cream. Beat the batter well and set aside to for couple of minutes and heat some oil in the meantime. Heat oil in a deep bottomed pan. Check the temperature of the oil by dropping a small drop of the batter in the oil. If the oil is ready and hot, coat the chunk of chopped veggies with the batter and drop it one by one in the hot oil. Fry on medium heat till it turns golden brown from both sides. Drain the chunks on the paper towel to soak the excess oil. Keep frying till you are done with the batter. Stuff the peppers with spiced potato stuffing and coat in chickpea flour batter and fry one by one. Enjoy it piping hot from the pan to the platter with sweet tomato, coriander and tamarind chutney and of course hot cup of tea. The hot combo of tea plus pakoras is absolutely sumptuous in this festive fall season. Relish it with a cuppa hot chai or warm hot chocolate. Indian vegetable pakora recipe. Learn how to make pakora with this easy pakora recipe! Do you love Indian buffet? If so, I am sure you have tried those perfectly fried vegetable pakoras. I always wonder how to make pakoras and am so excited that Sonia of My Creative Flavors is sharing her pakora recipe with us today. Sonia is a PhD in Psychology and a master Indian cook. Hailed from India, Sonia and her husband are now based in New Jersey. My Creative Flavors chronicles Sonia’s adventures in her kitchen; you will find many fusion Indian recipes, classic Indian dishes, and beautiful food photography on My Creative Flavors. Just look at these pakora pictures in this post, need I say more? Please welcome Sonia and remember to check out her site. This time of the year is all about fun, family and festivities. In these chilling winters, I just want to curl up in a cozy blanket and watch my all time favorite movies and enjoy hot cuppa chai with a platter of veggie pakoras. You bet its a great feeling—difficult to beat. What better than do what you like to do and get a chance to feature it on Bee’s fabulous site Rasa Malaysia. I have always been very fond of her easy to make and authentic recipes and look forward to her collection for all special occasions. I am really happy to do this feature and hope I will do justice to the high standards Bee sets for Rasa Malaysia. So today we are going to fry some mixed vegetables pakoras—one of the most popular Indian snacks. Pakoras always make a special place on the table as appetizers loved by family and in formal buffets too, across the globe. It’s an interesting way to add some spice and zing to the veggies once in a while and the hot combo is simply irresistible. Wash and pat dry the vegetables. Cut the florets of cauliflower, finely chop spinach and thinly slice the onions. Slit the peppers vertically. Boil and mash the potatoes in another bowl and add seasoning to taste. In another bowl take chickpea flour (besan), rice flour and add spices. Slowly add some water until the mixture reaches the consistency of whipping cream. Beat the batter well and set aside to for couple of minutes and heat some oil in the meantime. Heat oil in a deep bottomed pan. Check the temperature of the oil by dropping a small drop of the batter in the oil. If the oil is ready and hot, coat the chunk of chopped veggies with the batter and drop it one by one in the hot oil. Fry on medium heat till it turns golden brown from both sides. Drain the chunks on the paper towel to soak the excess oil. Keep frying till you are done with the batter. Enjoy it piping hot from the pan to the platter with sweet tomato, coriander and tamarind chutney and of course hot cup of tea. The hot combo of tea plus pakoras is absolutely sumptuous in this festive fall season. Oh, I love these fritters at the Indian buffets. Always load up a bunch. Thx for sharing the recipe. Yummy pakoras and sweet peppers!! can have any time of the day :). Amazing snack!! 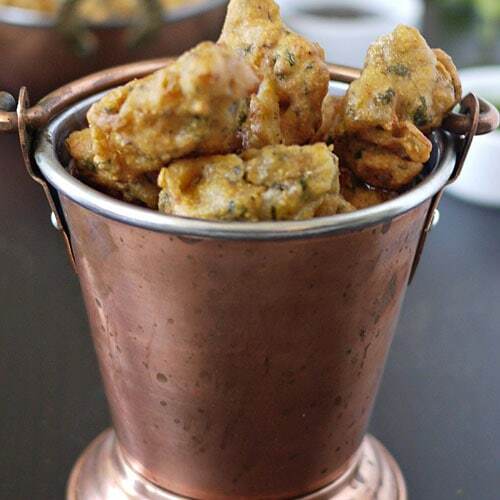 Pakoras are great in the evening with tea…yumm! I just got your book and can’t wait to start cooking from it. I am looking forward to good food and fun. Oh… they look yummy. Nice Recipe. Question could you bake these in the oven instead of frying? Trying to cut callories of fried foods. Recipes lovely. Spelling not so good. Particularly “cauliflower”.